Rescue swimmers in the Coast Guard have to be a tough lot. That’s even more true for female rescue swimmers. There are only four of them in the service, and that gives you a good indication of their caliber. 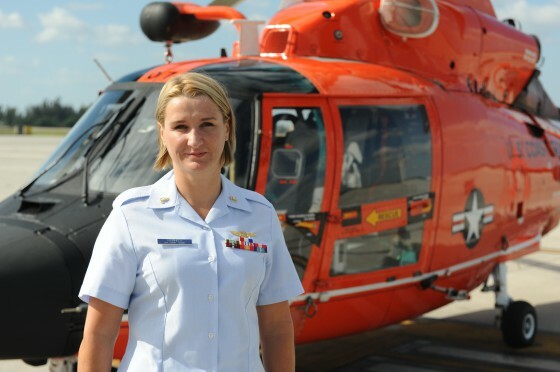 In April, we wrote about Aviation Survival Technician 2nd Class Jaime Vanacore, a rescue swimmer who was trying out for American Ninja Warrior (she got invited to Las Vegas for finals, by the way) and now Chief Aviation Survival Technician Karen Voorhees has made history by becoming the first female rescue swimmer in the Coast Guard to make chief. She was frocked May 15 at Air Station Miami and started a new job this week as a shop supervisor at her new station in Atlantic City, N.J. Prior to her, the aviation survival technician rating in the Coast Guard had never had a female in the rank of chief petty officer. But call Voorhees a female rescue swimmer and she will set you straight. She said “female rescue swimmer” is not a rate, nor is it a rank in the Coast Guard. Voorhees says she doesn’t know why there are not more females in the AST rating, and she doesn’t care if the service gets more. As a shop chief, all she wants is good swimmers who are smart and knowledgeable. She said their gender doesn’t mater. Nor is she impressed by the attention she is getting for becoming the first female AST chief. She said this is the first time she has felt singled out in the field. Voorhees said she didn’t set out to make history. It is just the natural advancement of her career, she was a first and the next step was to become a chief. “I’m 42 years old, I can’t jump out of helicopters forever,” she said. The fact that no women had attained that rank did not discourage her in the least. She believes that women are capable of a lot more than is expected of them. “The women that are respected on the hangar deck are the ones that work hard and hold their own,” she said. Great job Chief! The greater Mess is very proud of you. Hoo Yah “Rescue Swimmer”– notice I didn’t say “Female Rescue Swimmer”. 🙂 Cheers! Respect for all who are in our country’s special services who have devoted their lives to protecting us. Congratulations, Chief Voorhees.